Every September, Share Our Strength's Dine Out For No Kid Hungry™ brings together thousands of restaurants and their customers to raise funds for Share Our Strength’s No Kid Hungry campaign. This year, there are more than 8,000 restaurants to choose from. 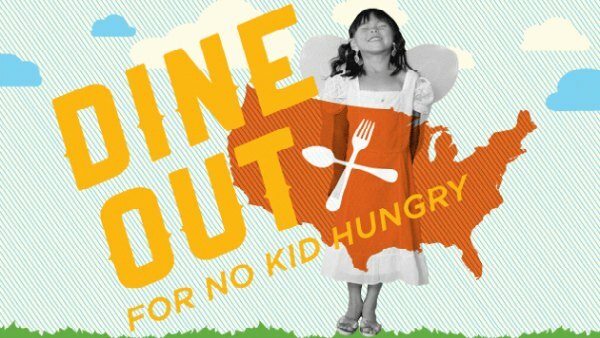 Find participating restaurants and check out their No Kid Hungry promotions. HINT: Click each restaurant's location for their details. Invite your favorite people to join you at your restaurants of choice. Download 'Thank You' cards to give the manager or your server when you dine out. Share the experience and spread the word, including the September 17 twEAT OUT. Repeat steps 1-4 all week long. The funds raised through Share Our Strength’s Dine Out For No Kid Hungry support the campaign and its work connecting kids in need with nutritious food and teaching their families how to cook healthy, affordable meals.